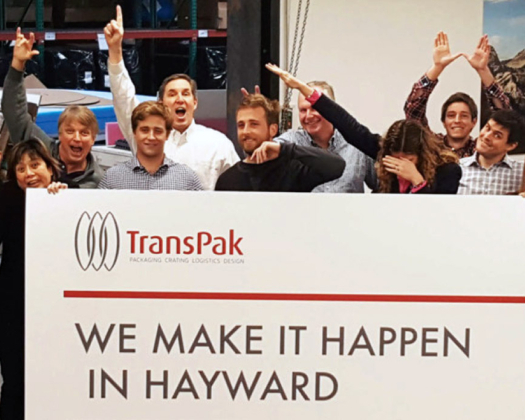 TransPak proud to be featured as a business leader in Hayward, published in this week's SF Business Times. “We were there then and continue to make sure their equipment was and is expertly packaged to arrive at its destination in perfect condition and on time,” says Bert Inch, TransPak CEO, whose family purchased the business in 1969. Customers rely on TransPak to be their one-stop shop rather than juggling multiple vendors. TransPak can meet their needs for crating, packaging, logistics, warehousing and distribution. With customers ranging from Fortune 500 companies to startups, TransPak has had to consistently innovate to package and transport sensitive electronics, semi conductors and medical devices. Globally, TransPak diverts more than 92 percent of its waste. “We’re proud of that,” says Inch.